Parliament Speaker inaugurates latest of 14 underground missile facilities with newly tested rocket, that UN says breaches sanctions. The state run PressTV as well as the semi-official Iranian Fars News Agency on Tuesday published new images, showing a convoy of the recently tested nuclear-capable Emad ballistic missiles being transferred to a brand new underground tunnel facility. Pictures in the Fars article show a convoy of numerous trucks bearing the massive missiles through a tunnel in the new "underground missile town," which the news site reported was visited on Tuesday by Iranian Parliament Speaker Ali Larijani. PressTV revealed video from the visit as well as pictures of Larijani. In his inauguration visit Larijani promised the Islamic Revolutionary Guards (IRGC) that the parliament would greatly increase the budget for Iran's controversial missile program. 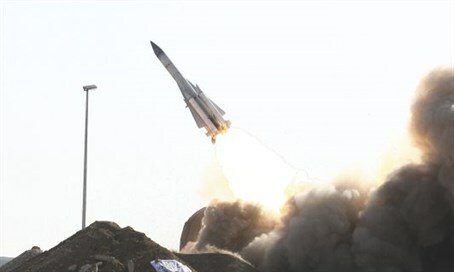 Emad ballistic missiles were tested by Iran on October 10. A team of UN sanctions monitors said in a confidential report seen by Reuters on December 15 that the medium-range Emad rocket launched in the test is capable of delivering a nuclear warhead, making it a violation of a UN Security Council resolution. A month later, Iran tested another ballistic missile, and an American official said other undeclared tests occurred earlier than that. In response, in late December US President Barack Obama threatened to implement new sanctions on Iran's rocket program. A day later Iranian President Hassan Rouhani threatened that Tehran would accelerate the development of its arsenal, and a day after that Obama backed down and delayed the new sanctions. The Fars report on Tuesday revealed that the "underground missile town" put on display in Larijani's visit is in fact the second such facility to be revealed in recent months. In October another deep underground tunnel facility full of missiles and launchers was shown, just several days after the Emad test on October 10. At the time, IRGC Brig. Gen. Hossein Salami said, "that was one of our oldest stockpiles and we haven’t yet shown our modern missile depots, where missiles with big cross sections have been stockpiled." Then in November, the Iranian news site reports that Brig. Gen. Hassan Karimpour, a senior adviser to the IRGC Quds Force responsible for covert terror operations abroad, revealed just how extensive Iran's underground missile system is. Karimpour said Iran has 14 missile depots ranging from 30 to 500 meters (100 to 1,640 feet) in depth, spread all around Iran and featuring automatic launchers. He said that "any country that dares to attack Iran will be riddled with missiles fired from these depots in large numbers automatically."